Disaronno (also known as Disaronno Originale) is an amaretto-flavored liqueur made in Italy that has a 28% alcohol by volume. The taste of Disaronno has a bittersweet almond taste and the company claims it is a secret formula from the year 1525. The company describes this liqueur as the infusion of apricot kernel oil with alcohol, burnt sugar, and seventeen selected herbs and fruits. Although it has a slight almond taste, it surprisingly doesn’t use almonds or other nuts as ingredients. Disaronno can be used to create many different kinds of mixed drinks. It can also be had on the rocks with no additional beverages added. Below are the latest Disaronno prices. Disaronno is one of those mixer liqueurs that can be mixed with just about anything. Its alcoholic content is not too low or too high so you get just enough of a kick from it. If you want your drink stronger, mix it with vodka. If you want it weaker, mix it with soda or juice. 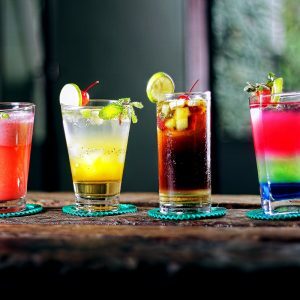 Below are some of the popular Disaronno mixed drinks. Disaronno Driver – 1 1/2 oz. vodka, 3/4 oz. Disaronno Originale Liqueur, and 4 1/2 oz. orange juice. Disaronna Punch – 1 1/2 oz. Disaronno Originale Liqueur, 1/4 oz. Orange Curacao Liqueur, 2 oz. fresh orange juice, 2 oz. pineapple juice, 1 oz. fresh lime juice, 1 dash of Angostura bitters, and 1 splash of club soda. Italian Tickler – 2 oz. Disaronno Originale Liqueur and 5 oz. club soda. Mob Witnesses – 4 oz. Disaronno Originale Liqueur and 12 oz. Dr. Pepper soda. Disaronno Cranberry Chiller – 3/4 part Disaronno Originale Liqueur, 1/2 part vodka, 3/4 part Triple sec, 3 parts cranberry juice, and orange juice. Jazzy Hour – 1/2 part Disaronno Originale Liqueur, 1 part vodka, 1/2 part tangerine liqueur, 1 part pineapple juice, and splash of lemon juice. Disaronno Colada – 1 1/2 parts Disaronno Originale Liqueur and 4 parts colada mix. Diserita Fresh Version – 3/4 part Disaronno Originale Liqueur, 1 1/4 part tequila blanco, 1 1/4 part guava juice, and 1/2 part lime juice. Disaronno Rose – 1 1/2 parts Disaronno Originale Liqueur, 1/2 part lemon juice, and soda water. Disaronno & Orange – 1 part Disaronno Originale Liqueur and 3 parts orange juice. Disaronno Macbeth – 1/2 part Disaronno Originale Liqueur, 1 part Tennessee whiskey, 1/2 part Blue Curacao, and 1 part sweet & sour mix. Mimosa – 3/4 part Disaronno Originale Liqueur, 1 part orange juice, and top with prosecco. Apple Pie – 1 part Disaronno Originale Liqueur, 1 part vodka, and green apple juice. Disaronno Breeze – 1/2 part Disaronno Originale Liqueur, 1 1/2 parts vodka, and cranberry juice. Disaronno Lily – 1 1/2 parts Disaronno Originale Liqueur, 1 part grape juice, and 1 part lemon juice. Disaronno Rookie – 1 part Disaronno Originale Liqueur and 1 part butterscotch schnapps. Gold – 1/2 part Disaronno Originale Liqueur, 1/2 part vodka, 1/2 part white rum, 1/2 part orange liqueur, and 2 parts sweet & sour mix. Disaronno Jazz – 1 part Disaronno Originale Liqueur, 1/2 part vodka, 1/2 part Blue Curacao, and 2 parts sweet & sour mix. Stardust – 1/2 part Disaronno Originale Liqueur, 1/2 part vodka, 1//2 part strawberry liqueur, and top with prosecco. Godmother – 3/4 part Disaronno Originale Liqueur and 1 1/4 parts vodka. Godfather – 3/4 part Disaronno Originale Liqueur and 1 1/4 parts scotch whiskey.